Three readings are assigned this week. Find links to two of them on the Course Schedule page, and one more is in ARES. Students often hear a lot about freedom of the press, but individuals’ rights to speak, write, publish, and gather together in groups are no less important. For this week’s essay (I’ll stop calling them blog posts), please read the assigned readings and then find an article or Op-Ed or essay online from a reputable source that discusses, in depth, a related case or cases that involves online media, mobile communications, social media platforms, or any other aspect of “new media.” My hope is that you will give us more to discuss and think about via the case you find. Don’t choose a case that involves the press, the news media, or an established news organization. Go for an individual, a group, an organization (can be an NGO) that is not “the press” or a journalist. The case can be about censorship, a lawsuit, removal of content, or about a complaint that content should have been removed but wasn’t. Freedom of association, assembly and petition all involve people forming and meeting in groups; you case you choose might involve an attempt to suppress a group rather than content. The case might involve content or group activity that was permitted, or that was taken down or forbidden. The case can be in any country. It doesn’t have to be a country with a democratic system of government. It does not need to be a legal case. Courts or legal proceedings need not be part of the incident or events. You don’t need an academic journal article. Something from The Atlantic, The New York Times, or another reliable source is fine. An opinion piece or analysis is fine. Just make sure it’s substantial enough to warrant discussion. In your essay, briefly summarize the case, link to it, and then specifically state which parts of the readings are illustrated by the case. Do your best to expand on the ideas of protected speech, assembly, petition. The usual length requirements apply. Set up a new blog for this course. Read the instructions. There is a Friday deadline here. Read all of the assigned readings for the week. Two articles are assigned this week (Week 2). Find Week 2 on the Course Schedule, and you’ll see the names of the authors of the two articles there. Then go to the ARES Course Reserves and download the two PDF files. Read how to access the course readings. Your deadline for publishing Blog post 1 is Monday, Aug. 27, at 9 a.m.
You must follow the instructions below, and then simply publish the post to your own WordPress.com blog. Before writing: While you are reading the two assigned articles, make a note of anything that’s new to you, anything you don’t fully understand, or anything you question (that is, you are not willing to accept it without further information, or you believe it to be incorrect). After you’ve finished reading, use Google to look up the things you have noted. Make it your goal to really understand everything you have read in the two articles. The same goes for words or phrases you do not understand. SLUG: The TITLE of your blog post about these articles must begin with the words “Internet and democracy.” This will make it easy for me (and other students in your class) to identify this first graded post in your blog! DO NOT use blog or post or 1 in the title. Content of the post: Of all the things you looked up (see above), write about the two (2) most interesting results. I expect these to be ideas that were new to you or that really challenged your thinking. Supply a functioning link to further information for each of those two (that is, two links total; not more than two). DO NOT use any links to Wikipedia (that’s too basic, and not very scholarly). The links can be to news articles, essays, blog posts, etc. — they need not be journal articles. Make sure you write specifically about both of the two assigned articles. Include each link within the sentence where it is most relevant. DO NOT paste links at the end of your post. Link correctly — here’s how. The point of the two links is to show what you learned, and where you learned it, while reading the assigned articles. Do not post a link to something you did not read, or something you did not learn from. The links tell a lot about you. When I read your blog post, I must have NO DOUBT that you have carefully read both articles completely. The best way to convince me is to actually read them, thoroughly, and look up anything that you don’t understand. If you write about something simplistic, or something mentioned only in the first two pages of the article, can you imagine what I will think about you and your commitment to learning? As a graduate student, your first job is to THINK. If you need any clarification about this assignment, please make a comment on this post. I will answer it here. There may be a delay before you see your comment, because I have comment moderation enabled for this blog. That means I will receive an email asking me to approve your comment. I will need to log in to WordPress and send the approval; afterward, your comment will appear and be visible to everyone. NOTE: This happens on YOUR blog too. Comments are not visible until you approve them! Make sure you are LOGGED IN to WordPress.com before you post a comment here! To complete the assignment that is due on Monday morning, Aug. 27, you will first need to set up a new blog at WordPress.com. If you already have a blog, DO NOT use that one. You must set up a NEW blog to be used only for this course. Follow this Quick Start Guide. Or, if you need more help, use the more detailed Get Started guide. Choose the FREE plan. No need to pay. Make sure you WRITE and SAVE both your username and password for WordPress.com. If you forget your username, you will lose your blog. NOTE: In Step 2, “Find a custom address,” go to the bottom and select “No thanks.” DO NOT PAY. If you already have a WordPress.com site, simply log in at WordPress.com and create a new blog using the same account. Do that here. After you have created your NEW blog, please write and publish a new post in it that briefly introduces you. What are you studying at UF, why are you taking this course, what’s your hometown, etc. Be sure to include your real first and last name so I can see who you are! The post can be quite short, e.g. 100 words. Please give the post an intelligent title. Check your blog site (blogname.wordpress.com) to make sure the new post is visible. After you complete steps 1–3, copy the complete URL of your blog from the Web browser address bar and paste it into a comment on THIS post (which you are reading right now). Add a photo of your face (large face) and your full name to your WordPress.com account. Do it here. Complete this task list before midnight on Friday, Aug. 24, so that you have ample time to complete the OTHER work that is due on Monday at 9 a.m. Note: Don’t worry if you do not see your comment appear below immediately after you post it. I have to approve it before it appears, which means I need to see a little notice that WordPress sends to my email. As I am not staring at my email every minute of the day, it might take some time before your comment appears here. You can embed a Storify into a blog post, but here I just gave you a link instead to save space on our course blog home page. That is an excellent example, made by a student. Notice how he inserted very helpful and well-written text above each link (or a closely related set of links) so that the Storify makes sense to us. The point is NOT to write your whole presentation — just to provide all the resources with a little bit of context attached to each one. Put an introduction at the top and a conclusion at the end. Making a Storify should not take too long, because you will already have all your links, as shown in class. Please use this Storify as a model for your own. Do not build your Storify until AFTER you give your topic presentation in class. NOTE: You would do well to notice that this student’s presentation was completely different from Ananya’s, even though they used the same two articles. If you entertained any ideas about using a student’s presentation resources from last year, please remember the PENALTY for academic dishonesty in this course. Yesterday I gave the topic presentation in class. Today I made a Storify that gives you links to everything I showed in class — and the videos are embedded too. Making this Storify took me about one hour from start to finish. Of course I already had all my links, because I had to show them in class yesterday. I tried to write just enough above each linked item or video to show how it made sense in the presentation. The point was not to write my whole presentation — just to provide all the resources with a little bit of context attached to EACH ONE. I also put an introduction at the top and a conclusion at the end. You should too. You have complete control over comments made on your posts on your own WordPress.com blog. 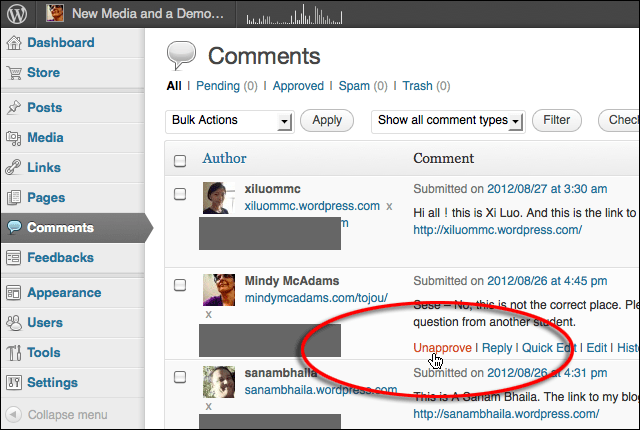 If I (or anyone else) post a comment on YOUR blog and you do not want others to see it, you can UNAPPROVE that comment. This is different from deleting the comment, because you can still see it in your Dashboard. To unapprove a comment, go to your Dashboard and click COMMENTS in the list on the left side. You will then have access to ALL the comments ever posted on your blog. Roll over the comment you want to unapprove (or delete, or mark as spam, etc.) and then you will see the list of options. Each one is a link. After you unapprove a comment, it is no longer visible on your blog, but you can still read it in the Comments list in your Dashboard. It is NOT ETHICAL to EDIT anyone’s comments in any way! Please limit your actions on comments to approve/unapprove, delete, mark as spam, etc. NEVER open a comment and edit it unless the author of the comment asks you to do so (for example, maybe the person posted the wrong URL and sent you a correction). The assignments during the semester will be posted here. Assignments will always have the category “Assignments,” so you can easily look them up. Just open the category, and you’ll see the most recent assignment at the top. The categories appear as buttons near the top of every page on this blog. The UF Libraries Course Reserves system (called Ares) is used for this course. Log in here to access Ares. For an overview of all the assignments and graded work in this course, see Required Work. For a calendar outline of the whole semester, see the Course Schedule. This week’s reading is Xenos and Becker (2009). Read the article before you start on the activity. To understand this thoroughly, please scan Baum (2003), looking for the ideas that Xenos and Becker use in their article. Your activity: Watch two complete episodes of The Daily Show that aired during the past 10 days. Afterward, go to Google News and browse for at least 15 minutes. Follow any links that interest you. Make notes about exactly what you are thinking about the headlines and stories as you browse and follow links. Your deadline for posting is Monday, Oct. 11, at 11 a.m.
SLUG: The TITLE of your blog post this week must include the words “Political Knowledge.” You should use additional words to make a sensible title. Content of the post: Based on your personal experience with the activity (above), are you similar to or different from the majority of Xenos and Becker’s respondents? Provide details to support your argument. IMPORTANT: Make it clear in your post that you understand Baum’s (2003) ideas. On a week when you did not write a blog post for this class, you still need to write three comments on other students’ posts. QUESTION: Where should you put those links so that I can click on them, see your three comments, and mark them? WARNING: Only do it this way if you did not write a blog post the same week! Trouble getting your comment link? The easiest way to get the URL to a comment you wrote is to copy the URL from the Web browser address bar immediately after you post your new comment. Even if your comment is awaiting moderation, the URL is available to you immediately. Some of the WordPress themes do not have the comment link. Wah!! IT WORKS! This URL goes straight to the comment that did not have a permalink. Most assigned readings for this course are in UF's ARES Course Reserves. UF Registrar: Course schedules, etc.